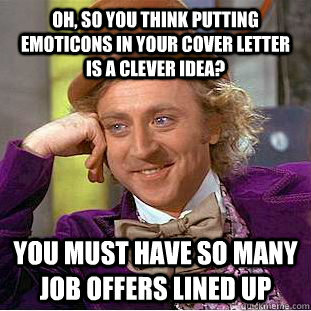 Many recruiters never read the cover letter, of course. However, unless you are told not to include one, cover letters are a job search must do. Here are three things to consider when creating a winning cover letter. Whether it’s a human or a computer reading your cover letter, including key words from the job posting will show the reader that you’ve done your homework. Be sure to clearly state the position you are applying for, the main skills required for the position and how your work experience demonstrates that you possess those skills. To really impress the reader, research the company and include one or two facts about the business that relate to the position you’re applying for (for example, “I read in Canadian Business that you won the XYZ Award for the best creative marketing campaign last month”). A cover letter offers the opportunity to directly address the reader, so if it’s not listed on the job posting, use your resources (Google, LinkedIn, a telephone) to find out who you need to address your letter to. To go the next step, make sure that your application lands in their inbox. Such upfront honesty won’t work for every industry, but this internship applicant was rewarded for avoiding a common cover letter downfall — the tendency to exaggerate your qualifications. Inflating your skill set by using vocabulary that’s outside of your everyday language makes a cover letter awkward to read and difficult to write. To create a cover letter that’s professional, yet conversational, don’t use two words where one would work and don’t use a 10-cent word where a two-cent word will do. A creative cover letter alternative must be of professional quality and must highlight your skills as they apply to the job you are competing for. For example, instead of writing a traditional cover letter for a corporate communications position, you could create a media kit about yourself including a press release, a fact sheet and your resume. At the very least, it may increase your chances of landing an interview. If you’re willing to go the extra mile to craft a creative cover letter, know the industry you want to work in, be professional and use common sense. A poorly executed YouTube video probably won’t get you an interview for an accounting position. However, a well-made website might put your resume on top of the pile for a digital media position. 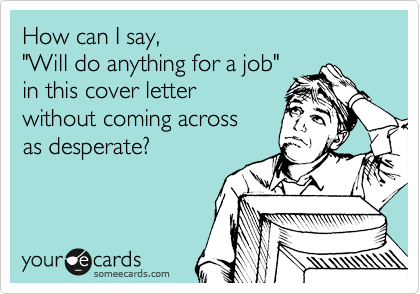 Do you think cover letters are becoming extinct? Have you had a successful creative cover letter experience? Let us know in the comments below. Desperate times often call for desperate measures — and in a brutal employment market, some job seekers may be tempted to falsify their work or education history in order to make themselves more attractive to potential employers. 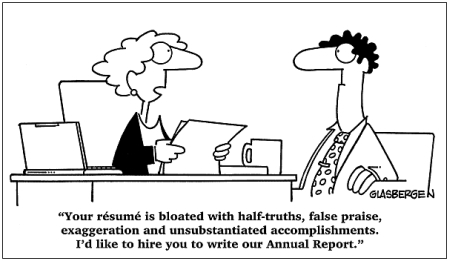 HireRight.com, a provider of on-demand employment background screening, found that 34 percent of job applicants lie on resumes. But job seekers who stretch the truth are playing an ever-riskier game. Background checks are much easier now. It’s all pretty open on the Internet. And many companies and recruiters now employ background-check providers who specialize in sniffing out untruths. Almost all career experts advise job seekers to customize their resumes to individual jobs they apply for. So where’s the line between self-promotion and falsehood? Some experts say it can be hard to define. The dictionary says that ’embellish’ means ‘to make beautiful,’ which is when a candidate is great at self-promotion. The difference between that and a damaging lie varies by industry and profession. For instance, financial executives are subject to more intense scrutiny than many people going into entry-level positions that don’t involve money. But at any point in your career, stretching the truth is risky — especially on official job applications. Any uncovered fib is liable to severely damage your reputation in the workplace. These are the same resume areas that, if you fudge them, can cause problems — the Internet has made it much easier to verify a person’s claims about education, for instance. And some recruiting firms are sleuthing far beyond a candidate’s given references to corroborate his claims — for instance, finding and contacting the candidate’s former colleagues via LinkedIn. People think that they can make up and embellish details about companies that have been sold or gone out of business. But LinkedIn, Facebook and our wide-ranging networks will put a quick stop to most efforts to change history in our favor. And even if false credentials get you the job, those untruths may come back to haunt you. You’re subject to immediate dismissal if it turns out you misrepresented something. If your company is acquired, for instance, the acquirer’s HR department may perform an audit of its new employees. Or your background may be checked when you apply for a promotion. Former Yahoo CEO Scott Thompson, former Notre Dame football coach George O’Leary and celebrity chef Robert Irvine are just three of the people who made news when false background information cost them high-profile jobs. Career experts have practical advice on how to deal truthfully with some of the problems that may cause people to lie — follow it, and you’ll be able to sleep more easily at night. Employment Gaps: Just because you weren’t getting paid for something doesn’t mean you weren’t being productive and gaining skills. If you volunteered or worked on your own projects, say, you should speak to those things on your resume, in a cover letter or in an interview. Misrepresentative Titles: Job seekers need to lay claim to projects and results that may not have been in their formal job descriptions. Here’s an example: An office manager took on HR in her company after the HR coordinator left. The office manager’s title was never changed, but she took on responsibility for payroll, benefits, and so on. She put all of that on her resume, and changed her title to ‘Office Manager (with HR responsibilities).’ That’s a perfectly good way for her to brand herself, because she hasn’t changed the title to something her old employer wouldn’t recognize or support. Past Salaries: If you feel you were underpaid, you should arm yourself with information about the salary you should be earning. Skills: If you’re tempted to lie about having a technical skill, for instance, the right thing to do is clear: Gain that skill by enrolling in a class (or committing to learning it on your own). Then you’ll be able to explain to potential employers truthfully that you’re working on getting up-to-speed in that area. 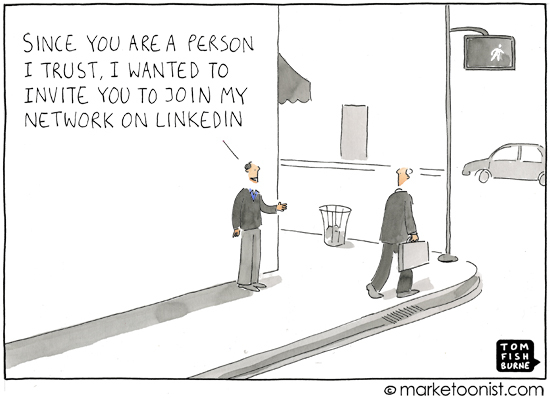 You’ve heard it hundreds of times before (and probably will hundreds of times again): You need to be on LinkedIn. But once you’ve created your profile, what’s next? If you’re not actively job searching, it can be easy to throw your information up there and leave it alone until you need to reach out to someone or browse open positions. Well, that would be a big mistake. You’ll be missing out on an opportunity to stay current in your field, interact with and grow your network, and even establish yourself as a thought leader. The good news? It doesn’t have to take a lot of effort. To keep things simple, here’s your plan for how to make the most of LinkedIn, broken down into easy, manageable chunks. LinkedIn is a great way to keep up to date on industry news and see what your contacts have been up to—both great things regardless of whether you’re job searching. If you check your homepage feed regularly, this will likely be the first place you’ll see viewpoints on news in your field or a contact’s new promotion posted. Interacting with your feed really only takes a couple minutes—just click over, scroll on down, and write a quick “congratulations” for new positions or promotions or click “like” on interesting new or articles others have posted. You’re done! 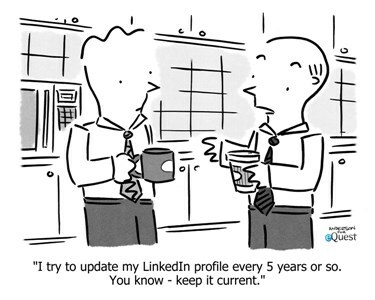 Aside from using LinkedIn to keep up with your network, try using it to update others on your professional achievements and interests. Target posting an update once a week: If you recently attended a conference or professional development seminar, write a quick update on what you enjoyed about it. Or, if you read something relevant to your industry, post it to the homepage feed to see what others think. If you want to do something a bit more in depth, LinkedIn now offers a platform for you to write and post your own articles. Much like your very own professional blog, it’s a great way to get your thoughts out there and your work seen. In case you haven’t noticed, LinkedIn is a great way to keep track of your contacts—but that only works if you’re consistently adding them as you meet them. So, set aside time once a week to send out invites (personalized, of course!) to connect on LinkedIn for the new people you meet in your day-to-day work—think vendors, people you’ve met at conferences, new co-workers or clients. Once you’ve connected, LinkedIn makes it easy to interact with your contacts’ updates as well as send personal messages when you want to reach out directly. While this isn’t something you have to do daily or weekly, it’s a good idea for you to keep track of any new job responsibilities or professional accomplishments and update your LinkedIn profile accordingly. Making a point to do this at least one a month ensures you’ll have an easy time updating your resume when the time comes and has the added benefit of allowing others to see your most up-to-date qualifications. Recruiters and hiring managers often scroll through LinkedIn looking for candidates, so even if you’re not actively job searching, having an impressive profile will mean that opportunities will still come your way. Groups on LinkedIn are a great way to interact with professionals with similar interests or backgrounds—but they’re really only as good as you make them. Contributing to larger, better-known groups could even help you establish yourself as a thought leader in your field. Of course, that takes times, so at the very least try to catch up on what relevant groups in your field are up to at least once a month. This will help you stay current, and if you make the effort to comment or contribute to existing discussions, you may even make some new connections. Few things feel as sleazy as reaching out to someone only after you realize you need them for one reason or another. To avoid setting yourself up for this uncomfortable situation, regularly reach out to a handful of contacts (switch up the contacts every month) to check in with them and see how they’re doing. Offer some updates of your own, and simply make it a point to catch up. The good news is, LinkedIn makes it easy—just shoot people a quick note, and it should pop right into the email they have linked to their account. No need to worry about up-to-date contact information! Make a habit of this, and you won’t have to feel awkward about reaching out to your contacts when you do need some help. LinkedIn is an incredibly handy tool for keeping track of contacts, what everyone has been up to, and the latest in industry news. And that’s all in addition to being a platform for you to promote your skills and expertise. So, don’t let your profile sit stagnant—make the most of it by actually using its features beyond the profile. You are currently browsing the Norwood Consulting Group blog archives for October, 2014.